To one group we have offered great customer support. To another we have somehow ensured customer success. We have one customer who read about us through a blog post, downloaded a trial and then reached out to us. We have had great interactions with him through telephone calls and web meetings where we have talked a lot about not only how to use ScreenSteps but how to successfully implement ScreenSteps in his organization. He is part of a major division at a Fortune 100 company. They are now one of our largest ScreenSteps customers, are looking at deploying ScreenSteps across the entire division and have other divisions evaluating ScreenSteps and ScreenSteps Live as well. Another customer who was attending the Dreamforce conference noticed that there was going to be a session on training. She told one of the speakers that he needed to check out ScreenSteps. The speaker reached out to us and we spent some time showing him ways to create successful training with ScreenSteps and ScreenSteps Live. As a result he made ScreenSteps a major part of his presentation to a standing-room only audience at his Dreamforce session. Another one of our customers contacted us last week to let us know that he was recommending that all of his customers get set up with ScreenSteps Live. ScreenSteps Live helped him communicate more clearly with his customers and helped his customers be more successful with the services he was providing them. Deployment of ScreenSteps across a major division at a Fortune 100 global organization. Prime presentation time to an audience who are prime candidates for benefiting from ScreenSteps (Salesforce administrators) at the premiere Salesforce event of the year. Steady stream of referrals from a customer creating repeatable, recurring revenue for us. Even fantastic "customer support" wouldn't have been enough to create the type of customers I have listed above. Those customers are passionate not because we solved customer support issues they might have had with ScreenSteps but because we made sure that they were *successful* with ScreenSteps. How do we replicate the experience that our most passionate customers have had with our happy but less passionate customers? How do we create more evangelists? How do we ensure the success of more customers? How do we make customer success a standardized, repeatable process? We are running some experiments in this area right now. I will let you know how they turn out in a future post. I would love to know what your experience with customer success has been. 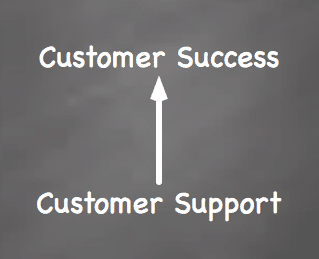 How have you helped your customers be successful? This is a major area that we are focusing on right now so anything you can share in the comments would be great.